Thriving licensed grocers and newsagents with post office outreach service situated in prominent position on main thoroughfare with three bedroom owner`s flat above. Commercial premises:- Shop. Storage and Preparation Area. Staff Cloakroom. Office. Cellar Storage. Owners accommodation comprises:- First Floor – Hall. Lounge. Kitchen. 3 Bedrooms. Bathroom. Moniaive is a bustling village with a strong community spirit and a long history, occupying a sheltered location where three glens meet. Nestled in the heart of the Dumfriesshire countryside, the village hosts a wide variety of annual events including a Gala, Flower Show, Horse Show, Sheepdog Trials, Folk Festival and Comics Festival, and it is also home to many musicians, arts and crafts people and writers. With a village population of just over 500, and a wide catchment area for local farms, the shop is always busy and the opening hours are 6.30am to 8.00pm Monday to Saturday and 9.00am to 5.00pm on Sundays. 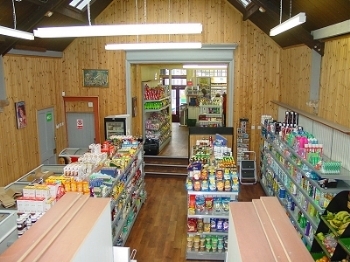 The shop is the heart of the village and as well as a licensed grocers, it stocks a wide variety of goods, including organic food, tobacco and hardware. The Post Office Outreach Service operates from 9.00am to 1.00pm daily except Sundays. The commercial premises extend to approximately 230m2 which includes shop premises, storage and preparation area and staff cloakroom. There is further cellar storage extending to approximately 70m2 with direct access from the shop. The shop is a family run business operated by a husband and wife team with the assistance of one member of staff working 30 hours per week and five part-time staff. Two south facing windows. Open plan with kitchen and with feature stone wall accommodating an inset fireplace with sandstone mantel and slips and a multi-fuel stove. Two south facing windows. Fitted with a range of units with solid wood worktops and Belfast sink. Space and plumbing for washing machine. Electric slot-in cooker. Fitted shower cubicle with electric shower. White suite comprising bath, WC and wash hand basin.. Radiator and heated towel rail. Small enclosed garden to rear. Mains supplies of water and electricity. The property is connected to the mains drainage system. Oil fired central heating. 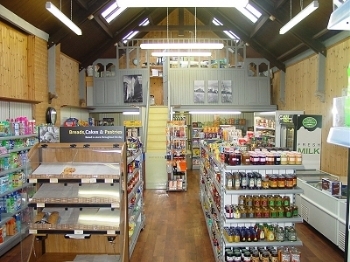 The rateable value of the shop is £2,800 per annum. The flat is in Council Tax Band B. 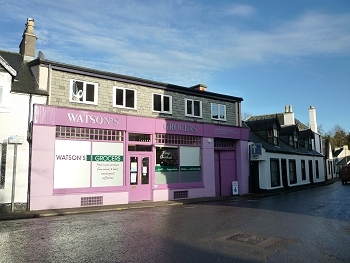 Offers in the region of £365,000.